Torah Mosheh 4: Bamidbar / Numbers Chapter 10 - ???? 10:2 Make you two tzotzerot (trumpets) kesef (silver); of a whole piece shalt your make them: that your may use them for the calling of the assembly, and for the journeying of the camps. 10:3 And when they shall blow with them, all the assembly shall assemble themselves to you at the entrance doorway of the Ohel Moed. 10:4 And if they blow but with one trumpet, then the princes, which are heads of the thousands of Yisrael, shall gather themselves to you. 10:5 When you blow an alarm, then the camps that lie on the kedem (east) parts shall go forward. 10:6 When you blow an alarm the second time, then the camps that lie on the south side shall take their journey: they shall blow an alarm for their journeys. 10:7 But when the congregation is to be gathered together, you shall blow, but you shall not sound an alarm. Who are suppose to blow the Trumpet? 10:8 And benai Aharon ha kohenim, shall blow with the hatzotzerah (trumpets clarion); and they shall be to you for an ordinance forever throughout your generations. 10:9 And if you go to war in your land against the enemy that oppresses you, then you shall blow an alarm with the hatzotzerah (trumpets clarion); and you shall be remembered before ADONAI Eloheichem, and nooshatem (you shall be saved) from your enemies. 10:10 Also in the Day of your gladness, and in your solemn days, and in the beginnings of your months, you shall blow with the tzotzerot (trumpets) over your Olot, and over the sacrifices of your Shelamin; that they may be to you for a memorial before Eloheikhem: ANI ADONAI Eloheikhem. 10:11 (v) And it came to pass on the twentieth [day] of the second month, in the second year, that the cloud was taken up from off the Mishkan HaEdut (testimony). 10:12 And benai Yisrael took their journeys out of the midbar Sinai; and the cloud rested in the midbar Paran. 10:13 And they first took their journey according to the commandment of ADONAI by the hand of Moshe. 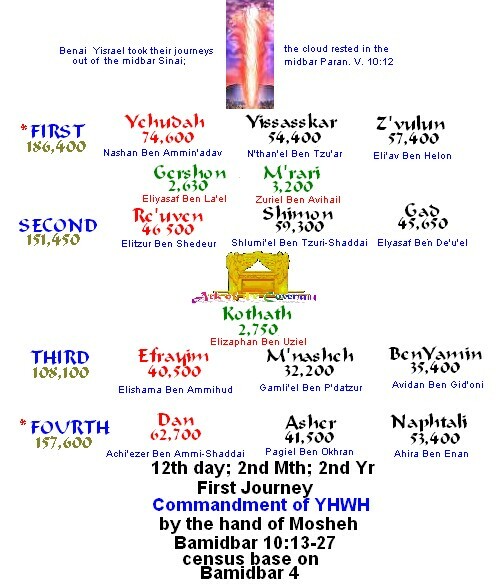 10:14 In the first [place] went the degel (standard) ha machaneh (camp) of benai Yehudah according to their tzivos (armies): and over his host was Nahshon Ben Amminadav. 10:15 And over the host of the Shevet benai Yissakhar was N'than'el Ben Tzu'ar. 10:16 And over the host of the Shevet benai Z'vulun was Eli'av Ben Helon. 10:17 And the tabernacle was taken down; and benai Gershon and benai M'rari set forward, bearing the tabernacle. 10:18 And the degel (standard) ha machaneh (camp) of Reuven set forward according to their tzivot (armies): and over his host [was] Elitzur Ben Shedeur. 10:19 And over the host of the Shevet benai Shimon was Shlumi' el Ben Tzuri-Shaddai. 10:20 And over the host of the Shevet benai Gad [was] Elyasaf ben De'u'el. 10:21 And the Kohasites set forward, bearing the sanctuary: and the other did set up the tabernacle against they came. 10:22 And the degel (standard) ha machaneh (camp) of benai Efrayim set forward according to their tzivot (armies): and over his host was Elishama Ben Ammihud. 10:23 And over the host of the Shevet benai M'nasheh was Gamli'el Ben P'dahtzur. 10:24 And over the host of the Shevet benai BenYamin was Aviydan ben Gid'oni. 10:25 And the degel (standard) ha machaneh (camp) of benai Dan set forward, [which was] the rereward of all the camps throughout their hosts: and over his host was Achi'ezer ben Ammi-Shaddai. 10:26 And over the host of the shevet benai Asher was Pag'i'el ben Okhran. 10:27 And over the host of the shevet benai Naftali was Ahira ben Enan. 10:28 Thus were the order of march of benai Yisrael according to their tzivos (armies), when they set forward. for ADONAI has spoken good concerning Yisrael. 10:30 And he said to him, I will not go; but I will depart to mine own land, and to my kindred. 10:31 And he said, Leave us not, I pray thee; forasmuch as your knows how we are to encamp in the midbar, and your may be to us instead of eyes. 10:32 And it shall be, if your go with us, yea, it shall be, that what goodness ADONAI shall do to us, the same will we do to you. 10:33 And they departed from the mount of ADONAI three days' journey: and Ha Aron BRIT ADONAI went before them in the three days' journey, to search out a resting place for them. And the cloud of ADONAI [was] upon them by day, when they went out of the camp. Vayhi binsoa ha'Aron vayomer Moshe; kumah ADONAI veyafutzu oyeveicha, veyanusu mesan'eicha mipaneicha. Rise up, ADONAI, and let your enemies be scattered; and let them that hate you flee before you. And when it rested (נֻחֹ), he said, Return, O ADONAI, to the many thousands of Yisrael. נֱאֶמָון Ne'emanThe letter nun n itself, symbolizes HaShem sitting on His Throne. It is the “bent nun,” which shows HaShem as diligently observing the works, deeds, and acts of His people. It pictures the faithful ones who is bent as in worship, and humility. The final nun, N, elongated in form, symbolizes the malakhim standing before HaShem in His presence. The final nun N, which the straight nun illustrates the faithful one who is erect, who will stand faithful and upright, When he faces the final Day of Judgment. Two nun Nafucha ("inverted nuns") of Hebrew alphabet. (נו"ן מנוזרת "isolated nun" or נו"ן הפוכה "inverted nun" or "׆" in Hebrew) is a rare glyph used in classical Hebrew. The inverted nun is not part of any word, and is never pronounced; thus it is classed as punctuation and not a letter. to be used to call an assembly together. the oneness, of the fellowship together of Hashem's people. to strengthen relationships and consolidate fellowship. come next to the cloud of Shekinah glory which rested upon the mishkan. worked together. Hashem will use the sound of a trumpet to gather His people for the ultimate assembling together - the caught up of the Assemble, to meet Adonay in the air (1 Thesalonika 4:16-18). 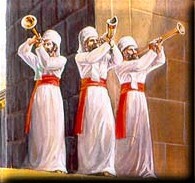 Tehillim 81:3 Blow up the Shofar in the Rosh Chodesh, in the time appointed, on Yom Chageinu (our solemn feast day). In the Set Apart Temple this was marked by the blowing of a gold plated shofar and silver trumpets by the three Kohanim. "Elohim has ascended with a blast, ADONAI with the voice of the shofar." Shemuel Alef 20:1-43 David & Yonatan 1020 B.C.E. Divrei HaYamin Alef 23:25-32 Levites praise 1000 B.C.E. Divrei HaYamin Bet 2:1-6 Beit Shlomo 950 B.C.E. Yeshayahu 66:15-24 Future worship 780 B.C.E. Divrei HaYamin Bet 31:2-10 Chizkiyahu 727 B.C.E.